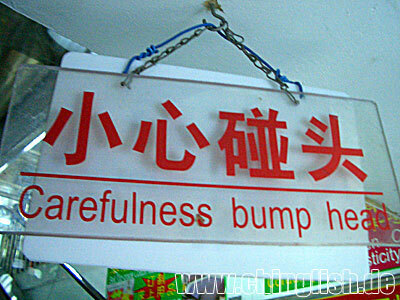 The Chinglish Files by olr: Variations on a theme. 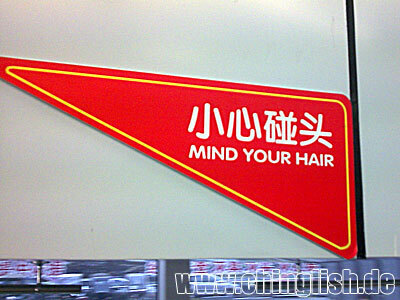 "小心碰头" xiao3xin1 peng4tou2 - "mind your head" is a sign that you can't miss whereever you go in China. That is, if the translation comes out right, which is not really happening in many instances. Please find a selection below. I am really puzzled when it comes to the last one! Many thanks to Kevin, Chris and Gordon for contributing to this selection! These are really funny with such unproper translations. i am interested in the correct translation. what is the correct translation of "小心碰头" in english? Would love to know if anyone can top it! Great blog! I'm a Chinese.That's really funny.But it is a shame too! Can you provide the correct translation in english? 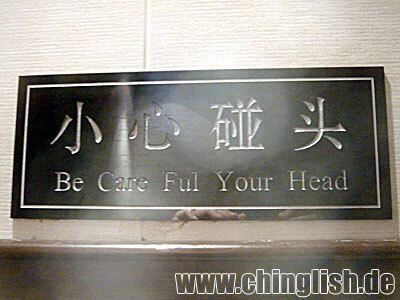 Basically the characters 小心碰头 say "Careful (Xiaoxin)Bump (Peng)Head (Tou)". 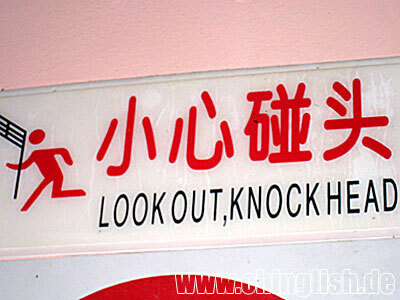 It's a typically abbreviated expression that a Chinese speaker can grasp right away but that doesn't translate well. 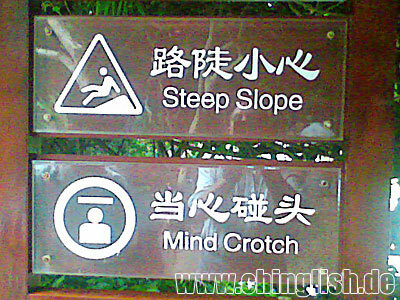 On the point about the last one, "Mind Crotch," this seems like a dictionary error. The characters for Dangxin (look out) and Dang (trouser crotch) are almost the same. 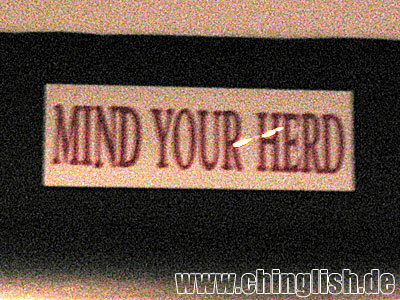 The Chinglish Files go academic.